Good day, as Premier of the Virgin Islands, I am pleased to report on progress with our recovery efforts following the passage of Hurricanes Irma and Maria. Devastation is obvious to all, but I want you to know that your Government is committed to leading the Territory through this challenging time. I must thank the international community for their support. Many countries and organisations came to our aid immediately following Hurricane Irma. I have been working closely with Governor Augustus Jaspert in coordinating relief efforts. 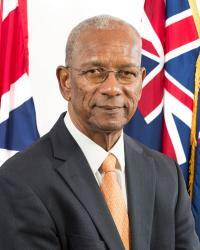 He has been working very hard with the UK offices and agencies to provide assistance such as additional security forces as well as the two ships that immediately responded with supplies following Hurricane Irma. Today, I am pleased to be joined by my colleagues who will join on reporting on their actions taken to date. I want to stress that the rebuilding of the Virgin Islands cannot and will not happen overnight. My Government will also be using the opportunity that Hurricane Irma brought to reset our compasses, and to get a few things right. We will be inviting you to share in the redevelopment process through town hall meetings, starting on Monday, September 25 from 5:00 -7:00 p.m. on radio ZBVI. Our immediate priorities are food, shelter, electricity, water, telecommunications, education and business continuity. As it relates to one of our main industries, tourism, after an initial assessment of damages were done, all marketing efforts were suspended and the Board continues to concentrate its efforts on supporting and speaking with tourism stakeholders locally as well as monitoring and responding to media coverage globally. Despite losses, charter companies are already working to ensure guests enjoy the sailing capital of the world, this coming tourism season. By the end of November, at least one property has made it clear that they will have 120 boats in the water; I have no doubt that others will do the same. I want to encourage businesses large and small to commence refurbishing and restocking. I’ve noticed that a few more businesses have started to open, and this contributes greatly in keeping our local economy going, but also raising our spirits and encouraging others to start rebuilding. Last week Thursday I started a series of meetings with business owners in the community and will continue those meetings next week on the western end of Tortola and on Virgin Gorda. It is a priority for me to ensure that our local businesses are up and running and that they continue to provide goods and services to us, but also jobs to our people for the continuation of our economy. Today I would like to announce that Government will be creating a special business development fund. Businesses will be able to apply for loans within the next two weeks. We will be looking at various agencies to assist us with adding to this fund. I have appointed our Director of our Trade Department, Karia Christopher with the job of Liaison Officer during this rebuilding phase. Government has also ordered and received pledges of generators. We expect them to be on island within the coming weeks and these generators will be donated to businesses. I have referred to the issue of price gouging before. Again I urge businesses to be reasonable. Now is the time for us to work together as a community. The quicker residents can get back on their feet, the better it is for businesses and our economy. There have been questions pertaining to the work permit and immigration status of residents who were outside of the Territory at the time of Hurricane Irma, or who subsequently left days after. Let me make it clear that persons with valid work permits, property owners and longtime residents of the Territory are free to return once our airport opens for commercial flights. Work permit holders will have up to three months after their permits have expired, to sort out their immigration status. We have also relaxed our labour and immigration policies to expedite the processing of skilled workers that will be needed to support businesses in the rebuilding process. As I’ve shared before, the Monday following Hurricane Irma, I met with banks and insurance companies to quickly address matters of liquidity and processing of insurance claims. All companies continue to reaffirm their commitment to supporting the rebuilding of our Territory. The Monday following the passage of Hurricane Irma, our financial services industry continued their work. Our services play a key role in business development globally, so our system and industry partners have always planned for business continuity. This allowed our financial services industry to be protected, and as a result industry partners are able to access our online incorporation system, VIRRGIN anywhere in the world. The Commercial Division of our High Court will resume operations on Monday, September 25 in Castries, St. Lucia to facilitate the continuation of business. I want to thank the financial services industry for their continued faith in the Virgin Islands, their dedication and swift action ensures that our business continues unaffected. I cannot thank enough public servants who have selflessly demonstrated their commitment to the Virgin Islands as they have worked around the clock in and with the National Emergency Operations. Services organisations such as Rotary have again demonstrated their commitment to our islands. To all public servants I want to say again thank you for your service, however, it is a new day in the Virgin Islands, and we will be calling on you even more to help lead the charge in rebuilding. This has been a sobering experience for all of us, but this is also an opportunity for us to reset our compasses, to grow stronger as a community, and to exhibit that community spirit, strength and independence Virgin Islanders of generations past demonstrated which led us to building one of the greatest economies in our region.